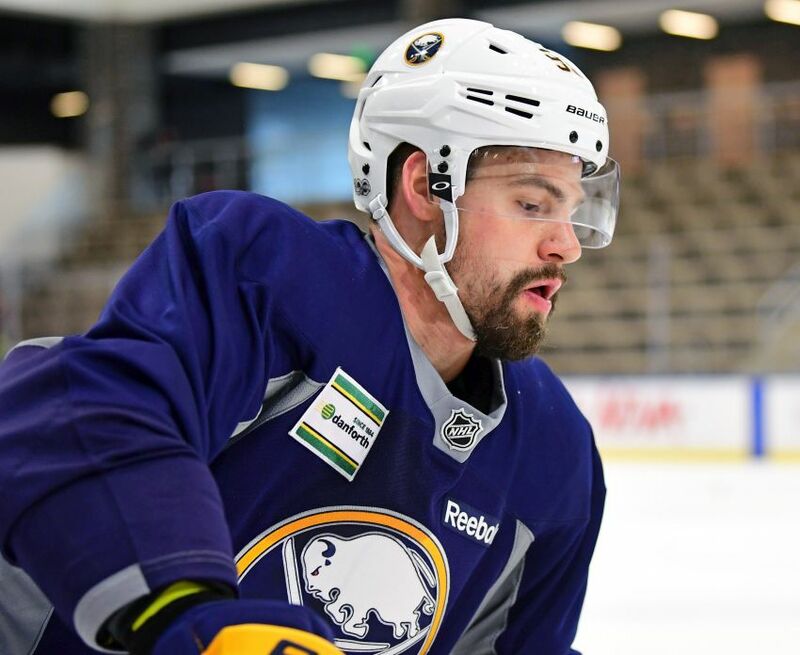 BUFFALO – Among the pro hockey players enjoying a late-summer skate Thursday inside HarborCenter, an unfamiliar face stood out, a goateed youngster in Sabres apparel sporting No. 93.
Who was it? Russian defenseman Victor Antipin, perhaps the Sabres’ most intriguing offseason addition. The Sabres, of course, signed Antipin to bolster their blue line. In the 24-year-old rookie, they possess a defenseman with puck-moving skills, an element they sorely lacked last season. But even in this information age, with seemingly anything available at your finger tips, very little is known about Antipin. He was unknown in these parts until word began spreading in March the Sabres would sign him. Why, for example, did he leave Metallurg Magnitogorsk, his KHL club, after five seasons? The undrafted Antipin earned a one-year, entry-level contract worth $925,000 because he morphed into one of the best defensemen outside the NHL. “I’ve been older, maybe a little bit more smart,” Antipin said. Antipin caught the Sabres’ attention as he compiled six goals and a career-high 24 points in 59 games last season. He then added seven goals – the most among defensemen – and 11 points in 18 playoff contests. Former Sabres general manager Tim Murray technically secured the 5-foot-11, 179-pound Antipin, although he officially signed under new GM Jason Botterill on May 25. With Antipin, Nathan Beaulieu and Marco Scandella, the Sabres have added three-puck moving defensemen this offseason. It’s expected new coach Phil Housley will turn his defenders loose like he did during his four years as an assistant with Nashville, a style that suits Antipin well. “I like to attack, join the rush, skate the puck,” Antipin said. That’s the same style Housley showcased as a defenseman throughout his Hall of Fame career. Antipin, who’s from Ust-Kamenogorsk, Kazakhstan, also likes Buffalo, a city he has been learning about in recent days. Excited to see this year’s Sabres and how management has fared in making a playoff contender. As an out-of-town fan, does anyone know where I can get a Sabres’ practice jersey?